Here are the most frequent questions asked by our readers and customers about the Cluster Tables for Over/Under Goals betting. If you can’t find an answer to your particular question, then please feel free to ask us using the comments section at the bottom of this page. We usually reply within 24 hours. These FAQ’s refer to the: OVER/UNDER ~ HO/AO Cluster Tables. Can I use the Cluster Tables for Trading? For example, you can ‘guesstimate’ the direction of odds movements prior to kick-off. As you can see, all of the odds moved in the expected direction. However, please be aware that this doesn’t happen every time. This match was an exceptional example with all prices (odds) moving in the ‘right’ direction. Therefore, if you are going to develop a strategy trading on odds movements prior to kick-off you’ll need to have a stop-loss mechanism in place should the odds move in the wrong direction. You can see that the expected probability for this game (in 90 minutes) having over 0.5 goals was 93.7%. Even though it may challenge a few preconceived ideas about probabilities, you must understand that at half-time, when the score was 0-0, the probability for match ending with over 0.5 goals was still 93.7%!! Even though the match had already reached half-time, the overriding probability for one goal hadn’t changed. But, the odds for over 0.5 goals certainly had changed – the price will have risen, not by a huge amount, but enough to turn the bet into a lucrative value bet. AT kick-off the odds matched the zero odds expectations at 1.09 (first screenshot: without HO/AO clusters) and were just slightly above the expected range of ‘fair odds (second screenshot: taking the HO/HO clusters into consideration), but at half-time, they were around 1.20 and therefore contained very healthy value. Just as a side note, there were two goals scored in the second half of this match. Of course, there are many other benefits that the Cluster Tables give to traders. To be able to estimate pretty accurately the probabilities on the total number of goals in 90 minutes is immensely useful for many trading decisions! Can I also use the HO/AO cluster tables for other markets e.g. 1X2 or BTTS etc.? The HO/AO Cluster tables have been developed exclusively for Over/Under goals bets. You can use them to identify value bets, to compile portfolios for the Over/Under market, to predict odds movements in the ante post market; they are even useful for trading as you can estimate the total number of goals expected in the game, but not for any other markets. Did you try this method of calculation of goals before producing it? If yes, what results did you have? I understand the concepts presented in it, but I am very sceptical about getting good results. I’ve seen a lot of so called experts selling products and services relating to gambling. Do you think someone can succeed long term with this method? First of all, neither the Over/Under course book nor its accompanying cluster tables are a ‘method’ or system! The course book teaches statistics and explains in great length how bookmakers use statistics to make profits; and the cluster tables contain a very practical application of statistics for those who wish to find an edge when making betting decisions. Statistics is a mathematical science that pertains to the collection, analysis, interpretation, explanation, and presentation of data; statistics is a collection of mathematical techniques and not a ‘method’! At this time, I was writing match previews for the German Betfair blog (until Betfair withdrew from Germany due to a change in the gambling laws there). The 274 bets relate to matches I reviewed and provided tips for in my Betfair articles. With the closing of the German Betfair blog I was forced to stop the public match previews, not because they were unsuccessful, but because they were hugely time-consuming and I lost the client who paid me for my time to do them. Each preview article cost perhaps five to six hours to carry out the calculations, choose the picks, and then write an article each time. Therefore, I had to make at that time the decision if either I’m going to become a (paid) tipster service or if I better develop Soccerwidow to an educational website and a reliable source of mathematical and statistical knowledge for bettors. I’ve chosen the second option! Because I strongly believe that it is better to teach people to think for themselves than encourage them to blindly follow someone else’s picks! 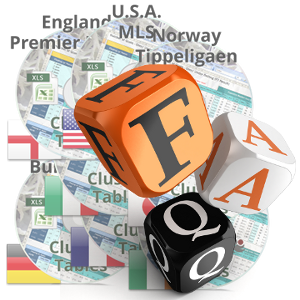 As a side note, readers of Soccerwidow as well as its German language sister site, Fussballwitwe, have been nagging me for years to reveal how I selected these hugely successful tips, which is why the Odds Calculation course came into being. Do I really need the course book to understand the Cluster Tables? The course is designed to introduce readers to the essential, fundamental knowledge necessary to understand odds calculation and the bookmaker market. Its intention is to introduce the subject of odds calculation to punters. A whole realm of statistical methods, distributions, graphs, financial terminology, and so on, are included in the course to show the reader how professionals (such as bookmakers) go about setting their odds. To put the Odds Calculation Course into perspective please look at the image above. Although the course serves as an ‘introduction’, if there were such a thing as a ‘betting degree’ available at universities then the mathematics and concepts contained in the course would be suitable for students at ‘Bachelor’ level. However, the Cluster Tables and utilising them properly and to their full potential is on the ‘Masters’ level, but like any degree, you first need to attain Bachelor status before attempting a Masters degree. Learning is hard for a great many people and you will really need to work fully through the course until you comprehend absolutely everything. Buyers of the course also receive the German Bundesliga Cluster Table, which is a fun tool to test on paper and for real money. We give it away as part of the course package as the Bundesliga is just about the most statistically compliant league of any you can find. Only, when you are comfortable with its use and applications should you consider purchasing more volatile leagues such as the English Premier League. In summary, you must thoroughly understand the fundamentals of bookmaking (e.g. odds calculation) before you can use that knowledge to your own advantage and, like everything worthwhile having in life, it will take time. Therefore, yes, you should really consider purchasing the course book if you want to fully understand and make the most of the Cluster Tables. Once I have worked through the course and bought a few Cluster Tables, will I be able to earn money from betting? At the end of the course there are a few suggestions (examples) on how to select value bets, and there are purposely included a few contradictory examples to make the statement that “many roads lead to Rome”. Each of those examples finishes with a profit but the approaches to pick ‘value’ bets are totally different. Unfortunately, there is no perfect ‘right’ or ‘wrong’ strategy that applies to every league in this world and to every bettor in each country. A blueprint suitable for everything simply doesn’t exist. Sorry! Make sure you truly work through the whole book and carry out each of the exercises in the course. Then, at the end, applying all your newly gained knowledge and experimenting with various selection criteria (firstly on paper, of course) you should reach a stage where you should be able to recognise value. It’s not easy, I know, but I’m sure that you will eventually utilise the knowledge in the course about odds calculation and the bookmaker market to figure something out that works for you. What is the HO/AO quotient? The division of HO (Home Odds) by AO (AO Odds) reflects the “strength” of the teams perceived by the public and makes upcoming games comparable with past matches, of which the results are known. When building the quotient we’re not asking ourselves the question, “Are these teams really equal?” or, “Is the favourite priced correctly?” We do not check the 1×2 odds at all; we simply use market prices and assume that the Bookmakers have taken statistics into account and reflected public opinion (e.g. team ranking) as well as they possibly could do when setting their odds. The HO/AO quotient is therefore an ideal method of comparing an upcoming match with the nearest batch of equivalent games against teams of a similar perceived strength to the opponent under analysis. If Hannover are 7.52 to beat Bayern Munich and Bayern Munich are 1.50 to beat Hannover, it makes sense to look at comparable matches where other teams carried similar prices in their respective home and away games in the past. What’s the significance of each HO/AO quartile? What do the clusters say about the comparative strength of teams? Take any Bundesliga weekend and cluster the matches according to the above HO/AO quotients (before kick-off) and check against the distribution of results. You will see that they hardly distribute according to the expectations (HO/AO clusters). That’s what makes 1×2 betting so very tricky. However, there is a strong correlation between the HO/AO quotients and the observerved O/U results! Unfortunately, the explanation is not short and/or sweet enough to pack it into an answer in the FAQs section. You’ll just have to believe that the HO/AO quotient is a very important factor when judging if OU odds contain value or not and, of course, you’ll find lengthy explanations in the course book. If I want to calculate the odds, say for Chelsea vs Arsenal coming up soon, would it be wise to get the Value Calculator AS WELL AS the Cluster Tables so I can get the more accurate figures for over/under goals? If you want to calculate the odds quickly for various betting markets, and you already have a good statistical knowledge and understanding, the Value Calculator is enough. However, if you are not so familiar with mathematical terms like ‘deviation’, ‘range’, ‘median’ or find it challenging to judge if prices (odds) are fair, then you should certainly consider the course book (not the Cluster Tables at this stage! They are an auxiliary product to the course book – You won’t be able to utilise them to their full potential without having worked through the course). For teams without five season histories, can I take the league average as a benchmark for deciding whether or not value exists in the given match? You can clearly see that the frequencies for the different teams are all very different. 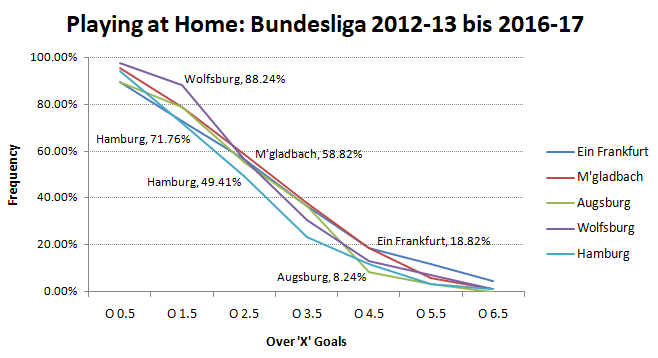 Please look closer at the Over 1.5 Goals curve: Wolfsburg, with the highest frequency of 88.24%, is still lower than the Bundesliga average frequency (93.2%). How can this possibly be? Bayern’s results tend to skew the Bundesliga averages and ‘corrects’ them to a level no other team achieves if looked at individually. Have a look at the Over 4.5 Goals curve: Bayern achieved 28.24% during the period shown, whilst Augsburg, for example, achieved only 8.24%. To reiterate therefore, it is not advisable to take the league average as a benchmark for deciding whether or not value exists in any given match. 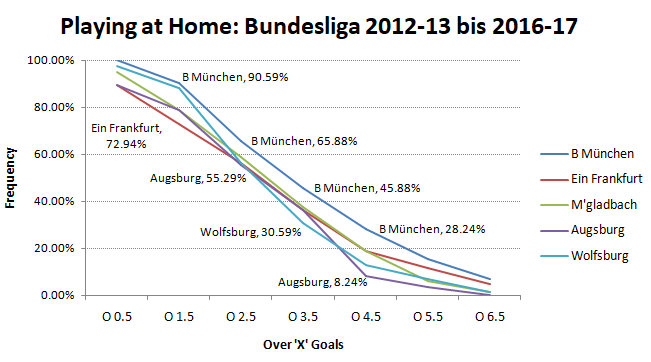 Even if you remove Bayern from the Bundesliga statistics, the results will be skewed by the next most extreme outlier, and so on. And unfortunately, this is the case in any league, not just in Germany. If the given match provides value above the league average, is this not also a value bet? League averages should never be a benchmark for any betting decision, neither in the Over/Under goals market nor in any other betting market. League averages contain all matches: those between very strong favourites and poorly performing outsiders; matches between equally strong teams, etc. Any team’s performance is totally different to another team’s performance: every football fan knows this. Only because ‘on average’ the probability for over 2.5 goals is 52.58% (e.g. 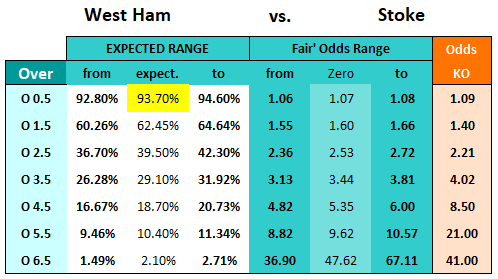 the EPL), it doesn’t necessarily follow that every match has a minimum (or maximum) probability of 52.58% (odds 1.90) as well. For example, the match Manchester United against Liverpool on 10th March 2018 had a ‘true’ probability of 62.50% (odds 1.60) to finish with over 2.5 goals. The highest over 2.5 goal odds at kick-off for that match were 2.00 and therefore it was a ‘value’ bet, but not because the odds were ‘above the league average’ but because they were above the expected ‘zero’ odds for that individual match. On the other hand, the match West Ham vs. Stoke on 16th April wasn’t a ‘value’ bet although its over 2.5 goals odds were 2.21, well above the league average (1.90). However, using the Cluster Tables and calculating the ‘true’ probability for that game (according to their HO/AO cluster) the probability was actually only 39.50% (in odds: 2.53) and therefore well under-priced. As a side note, Man Utd vs Liverpool finished with three goals (2-1) and West Ham vs Stoke with two goals (1-1). The ‘Over 2.5 goals’ bet for Man Utd vs Liverpool had a probability of 62.5% to win and the ‘Under 2.5 goals’ bet had a probability of 60.5%. That’s the reason why these two examples were chosen. At the time of writing these FAQs I was especially concentrating on EPL matches that had a probability of over 60% in the O/U 2.5 goals market. That both randomly chosen example games finished ‘statistically correct’ was a lucky stroke as there was also a good 40% probability in both cases that they wouldn’t. The Cluster Tables for different leagues have different prices. Why? The price of each league is dependent on the number of possible matches available for analysis during the current season. Remember, only matches between teams with five complete seasons in the league immediately prior to the season under analysis qualify for value bet detection using the Cluster Tables. For example, the 2017-18 England Championship (EC) Cluster Table contained only six teams (out of 24) with five seasons of data spanning 2012-13 to 2016-17: Birmingham, Derby, Ipswich, Leeds, Nottingham Forest, and Sheffield Wednesday. Only games between these teams would be available for betting using the Cluster Table approach. Therefore, from the full complement of 552 EC games during the full 2017-18 season only 30 (5.4%) were available for betting, hence this league’s low price of just £7.50. However, the 2017-18 England Premier League (EPL) contained 12 teams (out of 20) with five seasons of data: Arsenal, Chelsea, Everton, Liverpool, Manchester City, Manchester United, Southampton, Stoke, Swansea, Tottenham, West Bromwich Albion, and West Ham United. These 12 teams accounted for a total of 132 matches between each other, against the total number of 380 games in the whole EPL season. Therefore, 34.7% of games were available for betting in this league, and accordingly the price of the EPL Cluster Table was £27.50. The prices of the Cluster Tables will therefore vary each season from league to league as the number of games available for betting fluctuates with the numbers of teams playing in at least their sixth consecutive season. What does “valid for the 2017/18 season” mean? Leagues spanning two calendar years are what we term ‘Winter Leagues’. This means that the Cluster Tables will expire when the 2017-18 season finishes (different times for different leagues). However, timing your purchase of these Cluster Tables is not critical as we email to all clients who bought Cluster Tables in the second half of a season the updated and usually upgraded tables for the following season free of charge just as soon as they are published. What does “valid for 2018 season” mean? Leagues taking place within just one calendar year are what we term ‘Summer Leagues’. Again, timing your purchase of these Cluster Tables is not critical as we email to all clients who bought Cluster Tables in the second half of a season the updated and usually upgraded tables for the following season free of charge just as soon as they are published. As a purchaser of your fine book on football statistical analysis several years ago, I understand that I have lifetime access annually to the tables for the German Bundesliga league when they are renewed each summer. I was wondering if you might be agreeable to a swop from the Bundesliga to the English Premier League instead please? 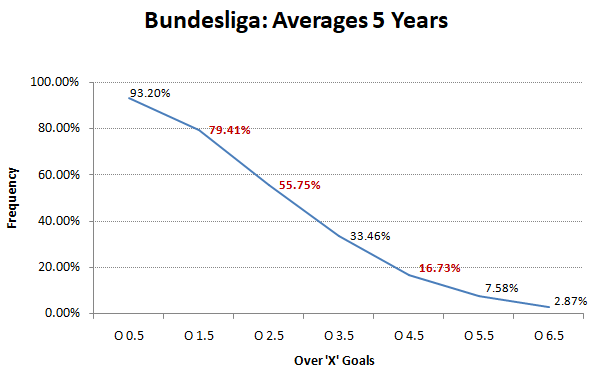 The reason the course book centres around the Bundesliga and why we give away the Bundesliga table as a free, fully working Cluster Table is primarily that the German league plays more statistically correct than just about any other league we know of. The free lifetime download that comes with purchasing the course book is therefore a download to the most reliable league, which should produce the most reliable results using the Cluster Table for betting. In contrast, the EPL is just about the most unpredictable league of all, but of course the most popular too when it comes to liquidity and low margins. Can I make the Cluster Tables by myself? It would be time consuming but much cheaper for me. Of course, theoretically it is possible to make Cluster Tables by yourself but believe me, your time is much better spent trying to figure out a selection system using the tables that works for you. Time is money, after all. Furthermore, the data collection is very time consuming. Spend the time more wisely making the tables work for you and hopefully at the end of the season you’ll find it easy to pay for their updated versions using some of your winnings. Let us worry about compiling the tables – they are complicated mechanisms, which need to be checked for accuracy by more than one person. Even if you’re an Excel expert, one mistake in the programming will give you false results. Do you have discounts for multiple purchases? To purchase the tables just go on the shop, put the tables you would like to buy into your shopping cart, and then apply the discount code depending how many tables you are buying. The code will reduce the total price to an amount which gives you the tables for the prices displayed above. I live in Hungary; if I understand you correctly, the purchase price for the EPL table is therefore £27.50 * 1.27 = £34.92. Is that right? However, you may like individual coaching; this can be done via email in connection with Skype or even in person, but for that you will have to travel to Tenerife for at least one week. But note that none of these training options is free. I am unsure of the Cluster Table’s purpose. They seem to provide the probability of over or under goals but doesn’t the Soccerwidow Value Bet detector do this as well? Therefore, what is the advantage of using the Cluster Tables over the Value Calculator? They both rely on different data as Value Calculator takes into account the last 25 league games of both teams plus the correction factor of head-to-heads, and the Cluster Tables take into account the team’s results against all other teams over multiple seasons. Which is more accurate? The Cluster Tables accompany the Odds Calculation Course and relate directly to its teachings. The betting tables within the Cluster Tables group the Over/Under bets into their correlation (mutual relationship or connection) with the strength of the teams. This being the case, they are much more accurate than the Value Calculator, but to fully understand why, you’ll need to purchase the Course. Furthermore, the Cluster Tables require minimal data input, whilst the Value Calculator requires gathering data manually and inputting it for the last 25 matches for both teams (plus the respective head-to-heads) for every match you wish to analyse. If you are looking to estimate the probabilities of many bet types, choose the Value Calculator. However, if you’d prefer a deep-dive approach and would like to learn more about odds calculation and the market dynamics of the bookmaker market then you should consider purchasing the Course. I am concerned about correctness of the HO/AO quotient. There are some bookmakers that constantly offer ‘heavily inflated odds’, e.g. 1.18 on Bayern at home whilst the next best price is 1.10. If we are using these odds as “public opinion correction factor”, and we have 79 bookies showing odds between 1.08 to 1.10 and just this one with 1.18. I wouldn’t feel comfortable using their price for any calculations. Of course, this only becomes an issue when it affects in which cluster group a game falls, but I already saw it happen twice in few matches I checked. Am I wrong to dismiss their odds in such situations? The Cluster Tables are using ‘Maximum Odds’ to calculate the HO/AO quotient, and for thus, we are using the data provided by Football-data.co.uk. The data comes from Joseph Buchdahl and is taken on Friday evenings for the weekend games and on Mondays for the week games. Therefore, if you want to be absolutely on the ‘safe’ side, then check the odds of above 15 bookmakers on Fridays for weekend games and on Mondays for week games, and then use their highest odds when choosing the applicable HO/AO cluster. Alternatively, just use the odds of all bookmakers (including the bookmakers with ‘heavily inflated odds’) and use their average odds for deciding which HO/AO cluster to pick. Despite the outliers you should find your match in the right cluster. “You can see that the expected probability for this game (in 90 minutes) having over 0.5 goals was 93.7%. Even though it may challenge a few preconceived ideas about probabilities, you must understand that at half-time, when the score was 0-0, the probability for match ending with over 0.5 goals was still 93.7%!! Is this true even if the match gets to say: 85 mins and it’s still 0-0? Even for any number of goals not just one? I have been told again, and again that time decay does not create value, so these statements are really hard for me to accept as being valid. That means that in 87.7% of the observed matches there was already a goal but 12.3% of the EPL matches (233) were still without goals (0-0) in their 80th minute. In 84 of these matches, there was at least one late 1st goal, meaning that in over a third (36.1% to be exact) of the goalless games in the 80th minute one goal was scored. So, the probability for a match finishing with over 0.5 goals after the 80th minute drops to 36.1% but only if you look at ALL matches but in the example I’m speaking about I’m not talking about the EPL statistics in general but about a particular match with a 93.7% probability and this probability remains unchanged, even at the 80th minute if there haven’t been any goals until then. Ok, well I might try and incorporate that then. In certain leagues, like Scotland, Belgium, apart from regular season there is a play-off round and/or relegation matches. Are cluster tables for O/U suited for those matches or should they be avoided? Although the play-off rounds and relegation matches are not included in the cluster tables to carry out the calculations you can certainly use the tables to judge if there is value involved in the odds or not. However, please allow for a higher uncertainty factor (error). The same applies for FA and other cup matches if there are teams playing that are covered by the tables. Cup matches are not included in the historical data in the tables in order of not screwing up the stats but if the teams are covered by the tables you can use the calculations for estimating value. 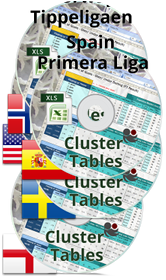 I’m trying to purchase 9 of the cluster tables: USA MLS, Japan J1 League, Korea K-League, Sweden Allsvenskan, Norway Tippeligaen, Brazil Serie A, Ireland Premier League, Finland Veikkausliiga and Iceland Úrvalsdeild. So I proceeded to the check-out. I entered the discount code (for 9 items which it says is a 45% discount). But the screen says ‘Please correct the following: Cart must have at least 9 eligible items to redeems this coupon’. Aren’t the cluster tables for each of these leagues eligible items? Sorry, I’ve just checked the problem and corrected a minor programming error – hopefully checkout should work fine with the discount code now. Again, sorry for wasting your time. Thanks for fixing that. One other thing, for some reason it’s now not accepting either my debit card or my credit card. Is that another glitch? It could be at my end, otherwise. I cannot think of any explanation why neither your credit card nor your debit card was accepted. Can you please try to check out via PayPal as a ‘guest’? If the problem persists then it’s probably your card(s), otherwise it may be a technical error with our credit card processor. I’ll contact them should you succeed with PayPal.